Your team members were excellent! Always a smile. Help was given asap when needed. I loved it. Clean and spacious. We like the space. It accommodates all of us. Sierra was very nice at check in and check out. It was just so easy as compared to other rental agencies. We've rented at Interlaken before - with another agency. So the condo itself was about what we expected. However the housekeeping was MUCH better. The place was cleaner than other condos we've rented in there. We got a kick out of the towels folded like dogs and the roses on the toilet paper. Plus we appreciated the nicer towels. staff were very friendly and accommodating. Our cabin was clean and roomy. We had everything we needed for our stay. We did not have air conditioning but there were fans to use both upstairs and downstairs and the cabin was comfortable except for a few hours midday..It was a very hot week when we were there and this is probably not a problem most of the time. We wouldn't hesitate to rent this property again and would recommend it to others. Love the Four Seasons cabins. Will be back next year. The Interlaken condos have the best view we have ever experienced in a vacation hotel or condo. We always love staying at the Interlaken condos. Sierra was fantastic and handled everything professionally I would hire her at our own properties! Been working with this team for 5 years. They have always meet my expectations. Beautiful property, with great views and amenities. Will keep coming back. Everyone from the booking experience to check out was awesome and so friendly!! Thank you so much for a delightful experience. The only downside to this property was the heat, which is completely out of everyone's control. Unfortunately, we didn't have electrical outlets upstairs so we couldn't plug in any fans to cool it down at night, but overall, everything else about this place was wonderful!! Can't beat that view and having coffee in the morning while deer roam around right beyond the patio. Thank you again for such a great stay! Sierra was great! She fixed our TV and checked on us a couple of times. Thank You Sierra! We were greeted by a friendly staff member named Sierra Rogers who went out of her way to assist us with our request and make sure our stay was comfortable. Another great experience with June Lake Accommodations! The entire rental experience was pleasant. 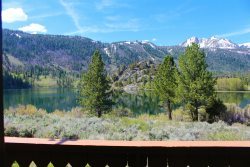 This is the first time we have rented with June Lake Accommodations and we have been coming to June lake for over 20 years. We will definitely be renting with you again. We really enjoyed the property and will likely be renting it again next summer.